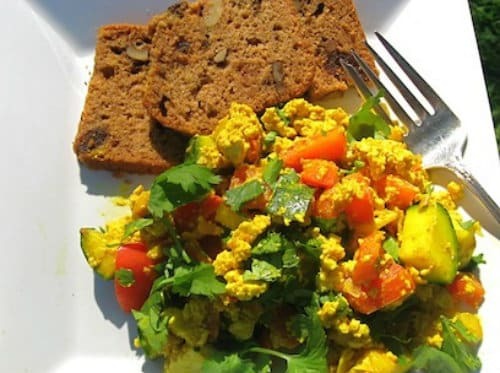 Tofu scrambles are great for any brunch party. Tofu scrambles are versatile, and they can be customized to any theme, season, or flavor pallet. Once you set the theme of your brunch party, you can very likely find a scramble that will compliment that theme. The best part about making a Tofu scramble for your brunch party is that they are simple to make! 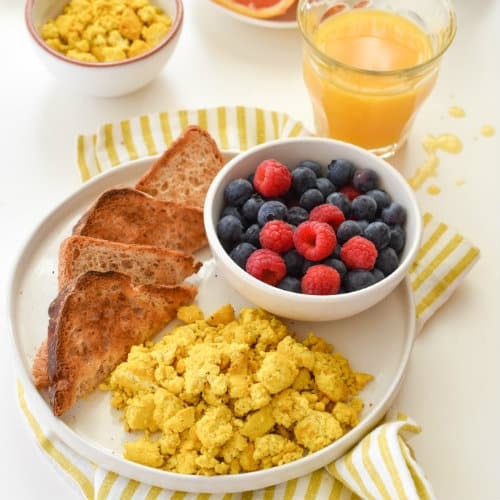 Here are a few recipe ideas of tofu scrambles that can help you get started planning your next brunch. Before we go playing with variations, here is the plain original. 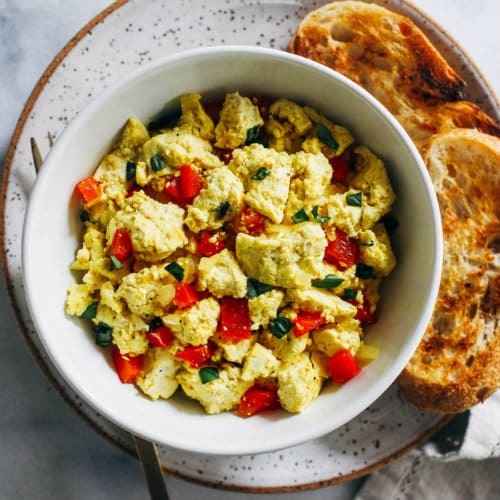 this is a simple recipe to make tofu scrambled eggs. You can make any variation if you know how to do the plain version. This is great for making tacos, sandwiches, or served as-is. This would be an essential component of making a traditional brunch. Serve it with tempeh bacon for a vegan twist on the traditional bacon ‘n’ eggs. 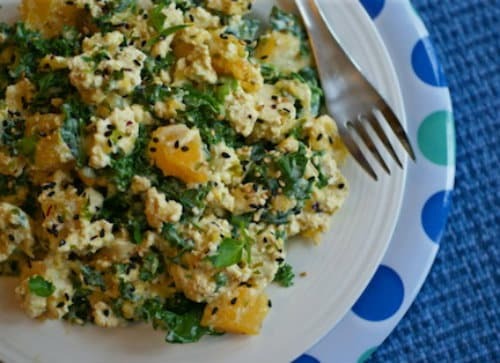 This scramble uses pumpkin or squash with kale to make a great fall themed scramble. This recipe utilizes produce that you can easily find in the fall and winter, so you could easily make this dish any time of year. Apple cider would be a great autumn beverage to serve along with this scramble. This tofu scramble is loaded with fresh vegetables that give if flavor, spice, and a Latin flare. You could easily add or remove vegetables to make it how you want it. Try serving it with avocado or guacamole to complete the fiesta theme. This scramble would be great served with tortillas. Unlike the previous recipe that is loaded with fresh raw vegetables, This recipe is more of a simmered saucy version. 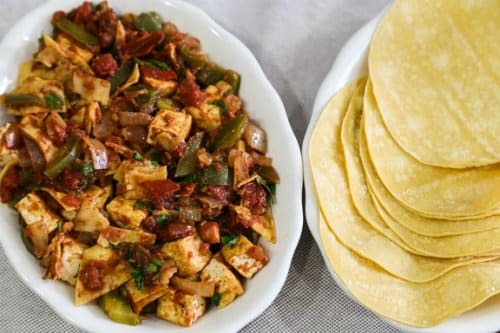 The traditional version of this dish is called Migas or Chilaquiles, and it contains tortillas, eggs, and veggies all simmered in a rich tomato sauce. this could be served with the fiesta scramble (above) to allow your guests to choose a fresh or cooked version of the scramble. The Bahn Mi has become really popular over the last few years. This sandwich would be a great way to have a Vietnamese themed brunch, and it would be a fresh and fun idea for your guests. There are three parts to this sandwich. The first is the scramble itself that is full of tofu, mushrooms, scallions, and shallots, and to be a true Bahn Mi you have to top it with a little “salad” of onion, radish, carrot, cilantro, and sriracha. The most overlooked component of a good Bahn Mi is the bread. 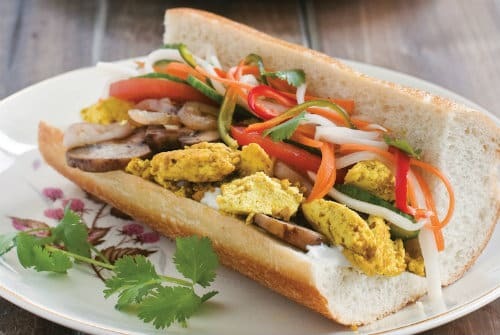 The name of the sandwich literally means bread (or baguette) in Vietnamese. Vietnam was a French colony for a long time, so the proper bread is a good french baguette. This dish is a traditional Middle Eastern and North African dish of eggs cooked in a rich tomato sauce seasoned with cumin. 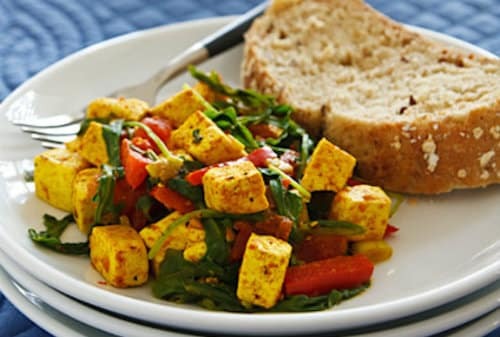 This scramble takes inspiration from that dish but uses tofu instead of eggs. this would be served with pita or another flatbread on the side for sopping. This would be a great centerpiece dish for a Middle Eastern or Moroccan brunch party. This is a great little recipe with lots of healthy spinach or arugula in it. The scramble is seasoned with turmeric and curry to make it a little more interesting flavor-wise. This would be a great summer brunch dish or a great dish for an India-themed brunch. if you are cooking brunch for your group of yogis, this would be a great dish to make. 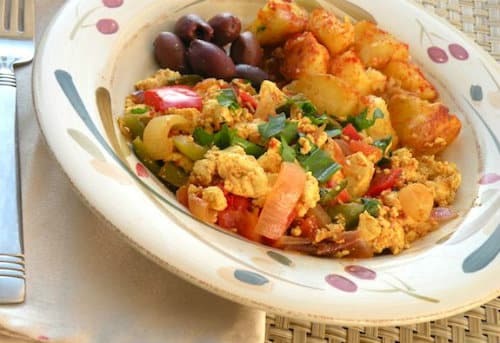 This tofu scramble recipe will make an Italian or Mediterranean theme work. This scramble has a shallot, fresh diced tomatoes, peppers, and basil. you can add garlic to bump the Italian flavors up to another level. Serve it with a nice crusty Italian bread, marinara, or a vegan pesto to complete the theme. Try these tofu scramble recipes for your next brunch, or just for you and your family. We hope that you can find inspiration here to make brunch for your friends and family.